The current issue of Donna Hay Magazine provided the inspiration for these cute mini Tomato Tart Tatins which were extremely simple to make. Instead of using the suggested cherry tomatoes I picked out the smallest specimens of Early Girls from Dirty Girl, the first I've bought this year. These tomatoes are dry farmed and burst with intense sweet flavour. The recipe requires pan-frying the halved tomatoes, shallots (also available from Dirty Girl), brown sugar, butter and sherry vinegar until they start to caramelize, before dividing them up into mini-muffin pans along with a sprig of thyme in each. (At this stage I popped the tray into the freezer to cool to a chill before adding the pastry which could start to melt otherwise.) Each is topped with a snug circle of puff pastry (I cheated and used my favourite locally made French Picnic pre-rolled pastry, cookie-cut to size) and baked until golden. The most difficult part of the entire operation is flipping the tart 180 degrees and out so it is the right way up. But it's not anything to fret over they are very forgiving and any topping that doesn't quite make it first flip can easily be reassembled. 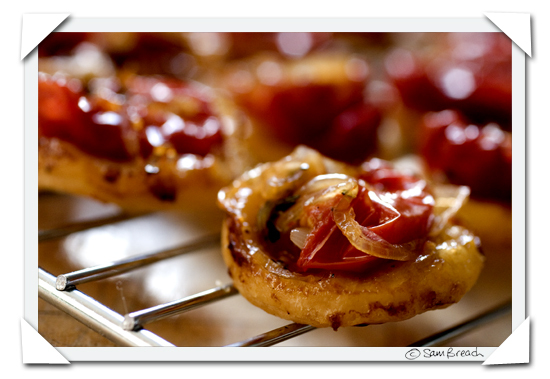 Tomato Tarte Tatins are perfect for passing around at parties. Welcome back--I am happy to see new delicious treats here on Becks and Posh once again. How sweet. I just ripped the plastic off my copy of the latest Donna Hay and was contemplating the beauty of those tartlets. Also the wavy cookies and all the things you can do with wontons. I just got a new computer and your photos do look stunning on my new monitor! yum. enidd likes to do a full size tomato tatin, and serve little slices with cheddar ice-cream. no, really. I'm sure it tastes as good as it looks! lovely new posts - welcome back! those little tomato tatins look fabulous. the tomatoes in our los altos garden are finally starting to come in with abundance and I'm always looking for new ways to use them. 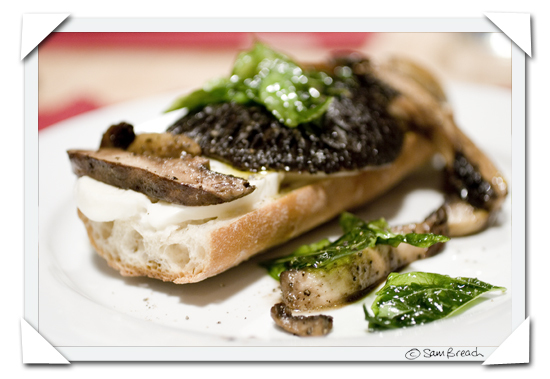 I want a lemon mushroom and mozerella toast NOW! You've got me feeling very hungry. Hmm..we're on the same wave length! Wow - I read this quickly this morning through RSS and missed the photo. LOVE the top one. Sam, love the tomato tart. True, Donna Hay's recipes may lack a little complexity, but a charred tomato -- especially a quality one -- can really compensate for an awful lot of flaws. I'm thrilled to see your loss of appetite for blogging was so shortlived. Very glad to see you back! Wonderful posts, as always. I'm going to be taking a little break for a vacation to Alaska soon! Wonderful to have you back. Love, lots of. Yummy looking recipes. The listing of local resources is a nice touch so I mentioned it the media roundup. I'm obsessed with tomatoes this season. Mostly heirlooms in Alabama and Georgia. I wouldn't dare roast them... they are perfect the way they are.